I thought we were good to go. But, since they asked (and they are just too cute) I had to comply. So we now have a line order with a rotating line leader. Don’t get me wrong, I have definitely used line order in the past, I just didn’t think this easy-going group needed it!! Anyhow, I whipped up a little sign to put on our door (more for a sub, just in case). You can download it by the green link below. 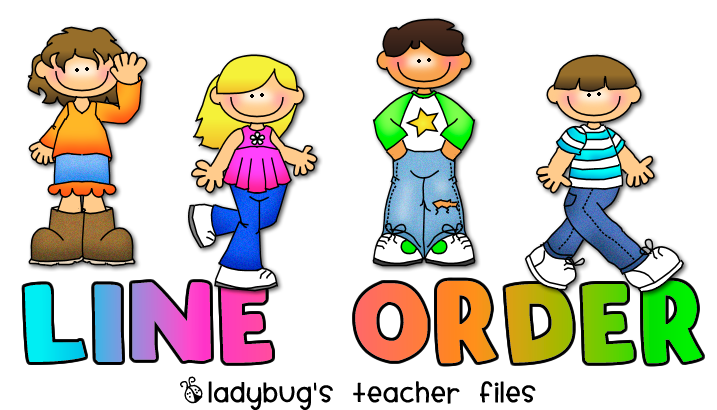 Do you use a line order with your class? Is your class funny about routines and structure? I always use a line order with a rotating line leader but we call it "our spots". When we get ready to line up, my kids always say, "In our spots?" Cracks me up every time. We do not have a specific order for our lunch lines (that's based on lunches from home or school lunches) or our dismissal lines because I have to have a front gate, back gate, bus, and after school class lines. 🙂 🙂 🙂 Thanks for the sign!! I think you seriously have a way of reading my mind…whatever I'm thinking I need you create a sign for! I love it! I have only done line order for the last 2 years and it is amazing as far as managing the class. Coming in from recess nobody fights to be first or last. My kids are doing # recognition since I've taped numbers to the floor. They practice counting painted unnumbered lines at recess to find their spots. It took a good chunk of September, but I LOVE number spots! It's the best thing ever (I use it for their go-home folders too). Yes I use line order. I don't need it so much for my kids in line but more because it is how I assign my students their numbers that they use as seat assignments and other things. I love the new sign. I already have a sign I made up at the start of the year with some scrapbook paper, but I am putting this one away for either my sub folder or next year.